Wall Street Journal was caught in the crossfire between the Syrian Electronic Army and Ira Winkler who is the CEO of security firm Secure Mentem. The Syrian Electronic Army(SEA) hijacked four twitter accounts belong to WSJ : @WSJD, WSJ Europe(@WSJPEurope), WSJ Africa(@WSJAfrica) and WSJ Vintage(@WSJVintage). 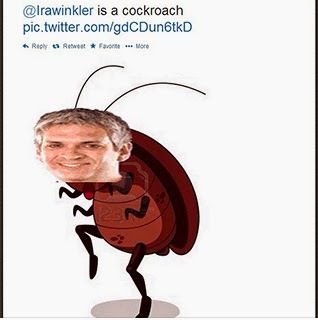 SEA posted the message "@Irawinkler is a cockroach" with a picture of Ira Winkler's head on the body of a cockroach. The attack was carried out in response to a RSA Conference presentation in which Winkler talked about the hacking methods of the SEA and made fun of them. In his presentation, Winkler also commented that "these people are like cockroaches of the Internet". This is not the first attack carried out by SEA in response to this presentation. Last month, the group also defaced the RSA Conference website and said "If there is a cockroach in the internet, it would be definitely you "
Wall Street Journal seems to have recovered the hijacked twitter accounts posted in twitter "We have secured our compromised Twitter accounts and they are now functioning normally."